400cc injectors with custom EDM nozzle and extensive internal modification. Dyno to +1000rwhp. Custom tuned chip included. 238cc hybrid injector with a 200% larger than stock nozzle. For competition use. Custom tuned chip included. 200cc hybrid injectors with a 200% larger than stock nozzle (while retaining factory HPOP). Custom tuned chip included. The 200/30% hybrid injector is a TERRIFIC upgrade for the customer who wants reliable, streetable power, without having to incur the extra expense of twin High Pressure Oil pumps, head studs, very large turbo upgrades, etc. The 175/146 injectors are a terrific upgrade for those 99-03 7.3L owners looking for efficiency as well as a modest power increase. The PureFlow AirDog II-4G A6SABF492 DF-165-4G Air/Fuel Separation System for your 1999-2003 Ford 7.3L Powerstroke is the next generation in the fuel delivery system, resulting in a long lasting, efficient and quiet lift pump. The Driven Diesel " Fuel Bowl Delete" Regulated Return Kit for the 99-03 Powerstroke Super Duty takes a popular "Standard" Regulated Return Kit to a new level. Just like a "Standard" version, this kit eliminates the "dead-head" stock fuel rails and provides adjustable fuel pressure capability to the Powerstroke fuel system. The Driven Diesel Regulated Return Kit for the 99-03 Powerstroke Super Duty is an important part of the fuel system upgrade process. This kit eliminates the "dead-head" stock fuel rails and provides adjustable fuel pressure capability to the Powerstroke fuel system. This kit fits 99-03 7.3L Ford Super Duty trucks. This kit ONLY includes the parts necessary to modify an EXISTING Regulated Return Kit, see the important notes below! 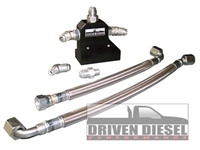 This kit provides the necessary components to connect the outlet of a high pressure FASS Titanium Series or AirDog II (including the latest 4G models) to the inlet of our Driven Diesel Fuel Bowl Delete Regulated Return kit. NOW FITS 6.0L APPLICATIONS TOO!!! The FASS FF-1003 HD Series Fuel Filter is a direct replacement for your FASS HD Series Fuel System. It's suggested that this filter is changed every 30,000 miles. The AirDog Replacement Water Separator WS100 is a direct replacement for your AirDog Fuel System. The built-in drain allows you to empty any water from the filter during routine maintenance. The FASS FF-3003 Fuel Filter is a direct replacement for your Titanium Series FASS Fuel System. This filter can also be used to replace the FWS-3003 on the Titanium Series. This filter has a suggested change interval of every 30,000 miles. The AirDog Replacement Fuel Filter FF100-2 is a direct replacement Fuel Filter for your AirDog Fuel System. The life expectancy for the AirDog Fuel Filter could be up to 25K miles or a year. However, those figures can change drastically depending on fuel quality. Order a few extra and keep them in your cab or toolbox.